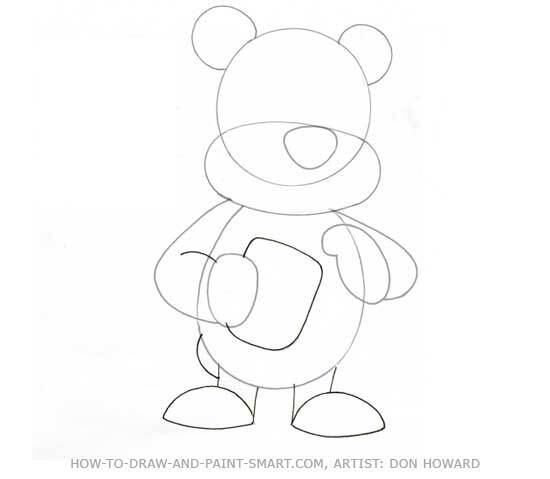 Drawing a Cartoon Bear Step by Step - The secret is all in the shapes. 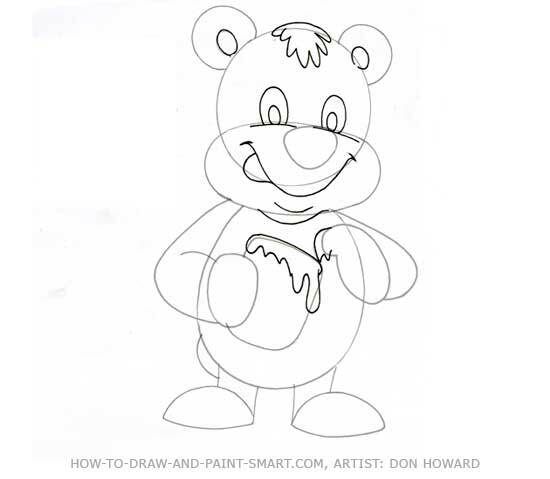 Get your Bears shapes worked out and you will have a cute cartoon drawing. This adorable little bear with a pot of honey reminds me of Winnie the Poo. I once lived in Duluth Minnesota and large black bears would occasionally walk through our yard. I remember the first time it happened. I was sitting in the living room of the small home we rented. A large black bear came lumbering through the yard and I supposed he was in search of some tasty morsel. My parents lived next door and I was worried that their little dog Sam would be out and that the bear might go after him. Sam is a Jack Russell Terrier and I actually think he would have been too quick for the bear to catch him. However, bears are much quicker that one might expect for such a large animal. 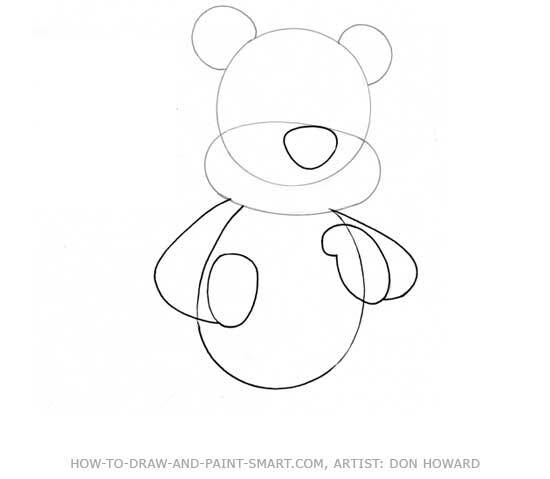 Now let's get started with the "How to Draw a Cartoon Bear"
Draw the shapes for your cartoon bear head. 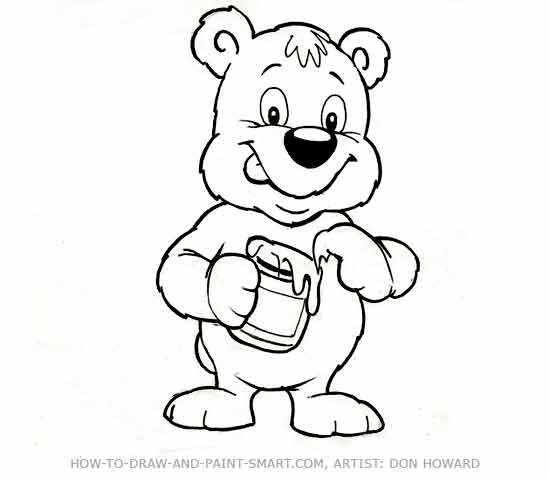 Add a nose ,body, arms and paws to your cartoon bear. Add a honey pot, legs, feet and tail. Also complete the top of the bear's right arm. 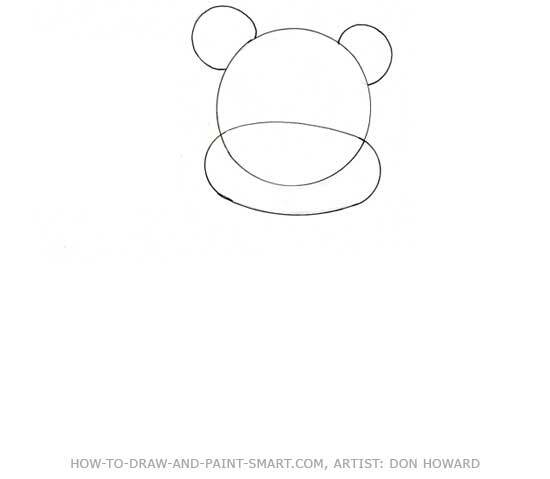 Draw the inside of the ears, a tuft of hair on the head, eyes and a mouth. This little bear has his tongue sticking out to taste the yummy honey. 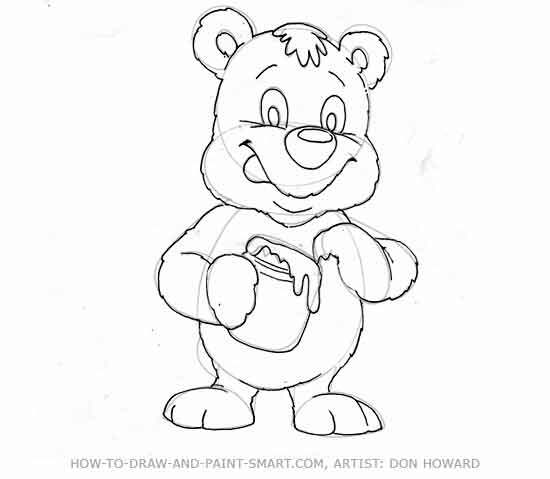 Clean up your bear drawing and erase the shapes you used to establish his proportions. 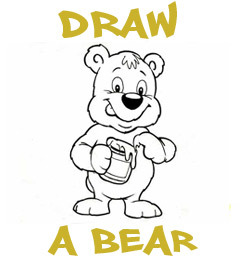 "How to Draw a Bear!" 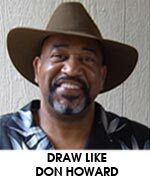 Smart Art Institute Online Lesson DH102 - Categories: Cartoon, Animation School, Graphic Design School, Kids Art Classes, Academy of Art University Prep., Graphic Design Colleges Prep.